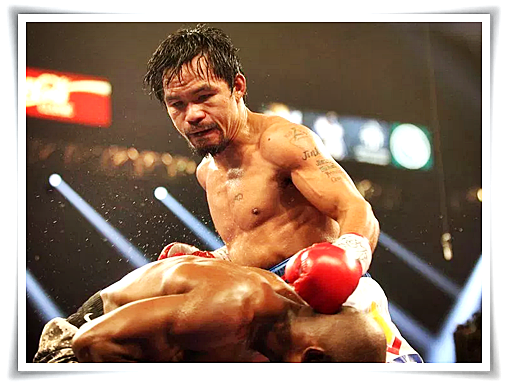 Producing one of his best performances in recent years, Champion Boxer Manny Pacquiao wins by unanimous decision against Timothy Bradley at MGM Grand Arena in Las Vegas, Nevada. This is the third and hopefully final fight of Manny Pacquiao vs. Timothy Bradley. The final score card shows Manny Pacquiao taking the fight 116-110 on all three cards. Manny Pacquiao most notable round is round Round 9. Think about Jack and Jill went up the hill to fetch a pail of water, then Manny hit Timothy Bradley with a south paw, Bradley came tumbling down. Lol! Okay, that's what came to my mind when I saw that scene! Pacquiao hurt Bradley with a massive counter left hook and then knocked him down with a follow-up attack. Bradley went down so hard he flipped over backward on his head. ( "Nag brengko si Bradley" ani G) The American Boxer Timothy Bradley beat the count on wobbly legs but Manny Pacquiao let him off the hook. 88-81, Pacquiao wins, and I think that is all that matters with him. Yes, Manny had vindicated himself. "As of now I am retired," Pacquiao said. "I am going to go home and think about it but I want to be with my family. I want to serve the people," Pacquiao reiterated. Congratulations to the People's Champ Manny "Pacman" Pacquiao!